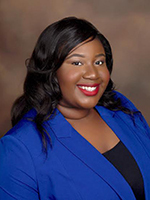 Claslyne Doris Jean Pierre is a Healthcare Professional with working experience in Graduate Medical Education, Physician Relations & Contracting, Program/Project Management and Process Improvement. She founded One Stop Management and Consulting Solutions, LLC a consulting firm focused on assisting aspiring entrepreneurs and philanthropists in creating sustainable nonprofit organizations and small businesses. Claslyne is committed to making positive impacts in Haiti, as well as her community and has been volunteering since the age of 15. She has volunteered and held many leadership positions with various organizations such as the International Club at Boynton Beach Community High School, Djakout Lakay at Palm Beach State College, Vision for a Better Haiti in Gonaives, and many more. In addition, She has held various leadership positions in NAAHP as well as the Conference Organizing Committee. She is currently the NAAHP Scholarship Coordinator. As a First Generation, Claslyne holds an MBA in Healthcare Management from Western Governors University and a Bachelor of Health Services Administration from Florida International University.